What sets Aloeride apart from the competition? 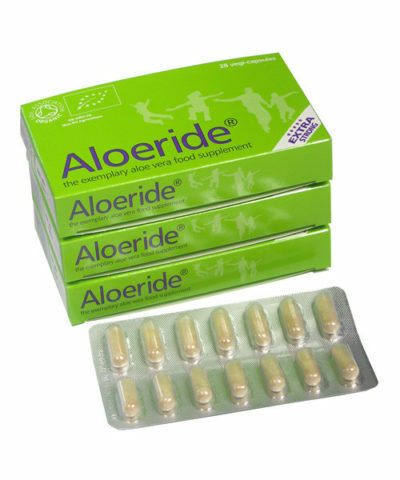 What sets Aloeride aloe vera apart from the competition is that Aloeride is a specialist whole leaf aloe vera food supplement that 100% conforms to Consultant Gastroenterologist and internationally renowned aloe vera expert Dr. Ivan Danhof MD PhD definition of ‘best aloe’. Yet Aloeride is very much more affordable than lesser aloe vera products. If you cannot find your question fully answered within this website, then please get in contact with us because we would love to help. 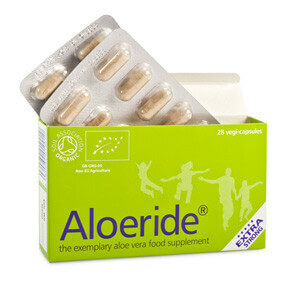 Aloeride Extra Strong gives you vastly more of the nutrients that are the magic of aloe vera. It has more oomph. That’s because we grow the most nutrient-dense species (Barbadensis Miller) under optimal, organic conditions and process these in a unique way to unrivalled quality control. Multiple, independent British, American and German laboratories laboratories confirm this and you too may find these test results an eye opener . A job worth doing is worth doing very well, it’s as simple as that. 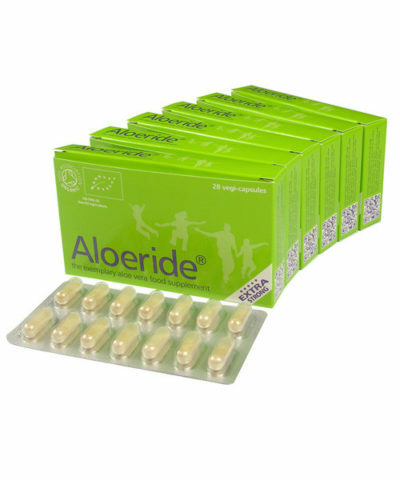 Aloeride Extra Strong optimises all the goodness of 2.4 litres of original aloe vera juice into 28 vegetarian capsules per pack. One serving (vegetarian capsule) is a generous amount to cover the average available binding spaces in the adult gut. We corresponded with Consultant Gastroenterologist Dr. Ivan E. Danhof PhD MD about this (next to a medical doctor he also is one of the foremost authorities on aloe vera) so you can rest assured that we got this spot on. You can take multiple servings throughout a day if necessary. The coni-snap capsules open and close easily should part of the powder content be required per serving. For certain people, notably those with digestive disorders, it is crucial to know that the laxative molecules in aloe vera have been removed from Aloeride Extra Strong. Thus you get all the molecules that help but effectively none of the molecules that hinder and would aggravate diarrhoea. Those with constipation could benefit enormously from our approach as well as from reading our advice leaflet. 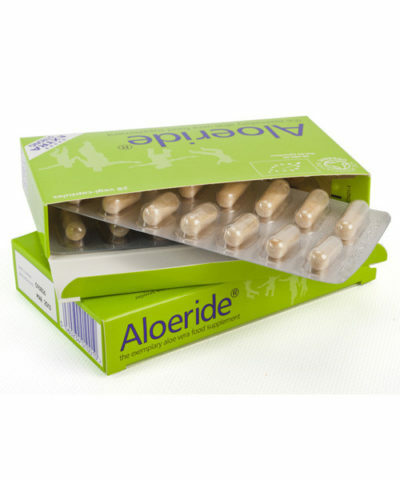 Aloeride Extra Strong is kept pure so there’s nothing to adversely react to: no additives, no flavourings, no colourings, no stabilisers. The industry standard measurement of aloe vera purity in Aloeride scores very significantly better than well-known aloe vera gel and aloe vera juice on the market. During production, our powder flows into its vegetarian capsules thanks to Aerosil® 200 Pharma which is the pinnacle in fully inert (i.e. no interaction with your body) colloidal silicon dioxide. That’s why it doesn’t detract from the independent laboratory verified purity of Aloeride. 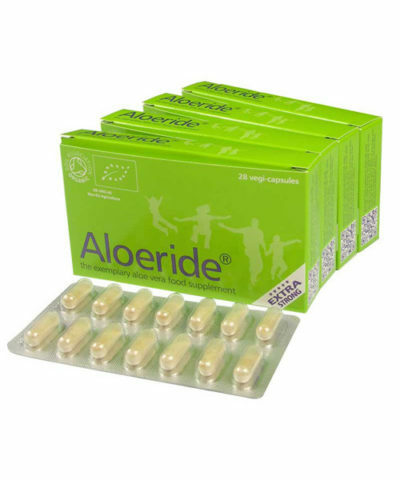 Aloeride Extra Strong shields you from the unpleasant taste of aloe vera juice (aloe vera gel) because it is a powder inside a vegetarian capsule. Great news for children and adults alike! Take a swig of water to wet the mouth, put the vegicapsule in your mouth, now swallow this with another swig of water, then drink the rest of the glass of water. You won’t need a fridge to store Aloeride in either, that said, if you buy a six pack then you may wish to store the five-not-yet-in-use-packs in a fridge especially if you’re in a hot (humid) country. Aloeride Extra Strong is certified organic by the Soil Association. Their meticulous standards are part of our quality control so you can feel assured that an independent, international official body approves of Aloeride. 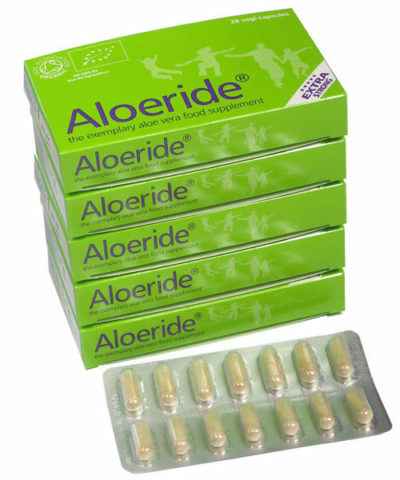 The proven unique quality of Aloeride Extra Strong is sold at a price so that pretty much everybody can afford it. Most of our customers buy the six pack which gives you 20% loyalty discounts as well as worldwide free shipping. We are a very personable company, friendly and knowledgable too. We give you free, properly useful advice in the 7-aspects of Our Approach. You can come to us with questions any time and we will always do our utmost to help and to make you happy. Just drop us an email or give us a call on 01858 464550 (Intl. 0044 1858 464550) or on 816 220 2626 if you’re in America or Canada.